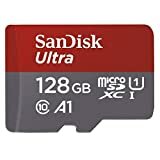 If you were bummed out last week because you missed the big Amazon sale that slashed the Sandisk Ultra 128GB Micro SDXC UHS-I Card with Adapter to less than $25, we have good news. You actually lucked out by missing that sale, because right now it’s on sale at a new all-time low! The Sandisk Ultra 128GB microSD card is the best-selling microSD card on Amazon’s entire website, and you can snag one right now for less than $22. What are you waiting for! ?